Proto Tahitic *Kānuka, A tree with hard, weapons-grade wood, or medicinal properties. Kānuka - Kunzea robusta, closeup of foliage. Tahitian : Nuanua (Decaspermum fruticosum); 'anu'a "A tree with hard wood"
The names Mānuka is shared by the New Zealand Kunzea species with two other trees - Leptospermum scoparium (Mānuka, kahikaatoa), and Leupogon fasciculata (Mānuka rauriki, Mingimingi). Mārū is an alternative name for Kānuka in parts of the East Coast / Bay of Plenty region. There is further discussion of the tangle of names for these plants in the paragraphs below. The most widely used names for the group of trees known collectively as mānuka or kānuka are derived ultimately from the Proto-Austronesian word root *nuka ("wound") and the formative prefixes mā- and ka- respectively. This is discussed in the page about the Proto-Polynesian word root (see the link at the top of this page). Mānuka rauriki "small-leaved mānuka " is occasionally used as an alternative name for several species of Kuznea, referring to their smaller leaves than the "other" mānuka, Leptospermum scoparium, a related plant also called kahikaatoa (there's a link below). Because of the multiplicty of names and overlapping meanings, there are five separate pages in this set: (1) Proto-Polynesian *nukanuka, with its antecedents and reflexes; (2) the Māori word mānuka in its own right; (3) mānuka in the form of members of the genus Kunzea, a.k.a. kānuka (this page); (4) mānuka in the form of varieties of the species Leptospermum scoparium, a.k.a. kahikātoa; (5) mānuka rauriki in the form of Leucopogon fasciculata, a.k.a. mingimingi. 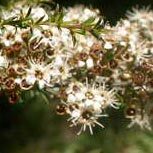 This page concentrates on the plants placed by botanists in the genus Kunzea, which for the sake of clarity we will call kānuka, to distinguish them from the Leptospermum species, which we can refer to as kahikātoa. 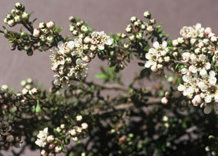 In Māori usage both are called mānuka in the North of New Zealand, with the Leptospermum varieties referred to as kahikātoa when there is a need to distinguish them from the others. Elsewhere the Kunzea species are generally referred to as kānuka or mārū, and mānuka refers to those currently grouped botanically with Leptospermum scoparium. A fifth name, rauwiri, also comes into the mix; it can refer to either kānuka or kahikātoa, and is discussed at the end of this page. 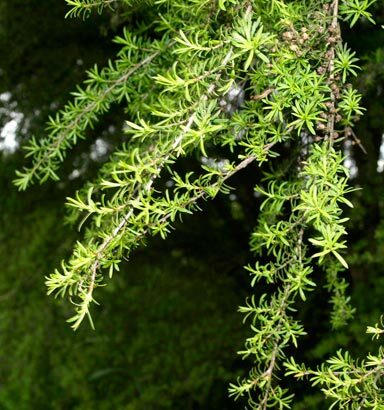 The kānuka form a group of generally fast-growing trees, with smaller flowers and smaller, softer leaves than the kahikaatoa. 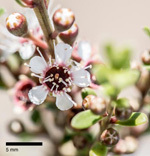 In 2014 the botanist Peter de Lange published a monograph, "A revision of the New Zealand Kunzea ericoides (Myrtaceae) complex", which established ten distinct species of Kunzea, all endemic to Aotearoa. Three of these species are confined in nature to offshore islands, one to parts of the South Island, three are endemic to the North Island, and the other three are found in both the North and South Islands. There are other species of Kuznea endemic to Australia; none are found naturally on both sides of the Tasman Sea. The notes which follow are linked to the individual pages for each species on the NZ Plant Conservation Network web site, where much more detailed information is available. 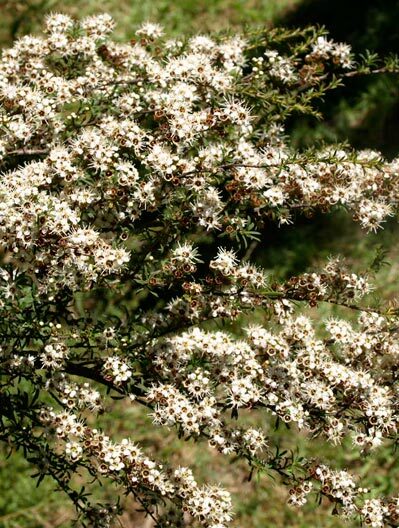 The most widely distributed and conspicuous species in Aotearoa is Kunzea robusta, found throughout the North and South Islands. This is grows to around 15m high (sometimes considerably higher), in forests and scrubland, with a trunk 50-60 cm or more thick when mature and with a hard, durable, whitish wood. It is an excellent host to a wide range of native wildife, and also a good nurse tree. There are many of these kānuka scattered throughout Te Māra Reo. This species may be said to be the archetypical kānuka (even though it is generally known as mānuka (and occasionally as rawiri nui) in the North or mārū in the Urewera and parts of Te Tairāwhiti. In mature trees the bark may peel off from the bottom in tubular strips up to 4 m. long. The stems, leaves and fruits are covered in small hairs. Kunzea linearis is confined to the northern section of the North Island, from the Mangonui to the Waitemata Harbour, and across to Coromadel, Aotea (Great Barrier Island) and the Hauraki Plains. It is one of the species known also as rauwiri (or rawiri), probably because it would have been especially useful in constructing fences and eel weirs. It grows to about two metres high with the tiny leaves (less than a milimetre wide) densely crowded on the slender branches. Kunzea amathicola is also known as rāuwiri, rauwiri toa or mānuka in its Tai Tokerau habitats, although it is also found (and known as kānuka) further south, extending to the Kāwhia area, the Horowhenua coast, and the Northern tip of the South Island. It can grow into a fair sized small tree (up to 15 m), and is distinguished from other New Zealand species of Kuznea by having a different juvenile and adult forms, larger flowers than other species of Kuznea (often just over a centimetre wide), with plants flowering from about a year old. Juvenile plants have many branches, often interwoven, but the adult trees generally have the lower part of the trunk bare, and the upper foliage forming a rounded canopy. Kunzea serotina is a tree growing from 3 to 30 metres high, often with a butressed trunk and a pyramid shape. It is found in the Central North Island and the north and east of the South Island. Dr de Lange reports that in the Central North Island it is called makahikatoa. This is an interesting and rather odd name, but it is also the name of s stream along the Moawhango-Napier road, from which specimens of this species have been collected. There is a suggestion that this might refer to the white wood (in contrast to the red wood of the word kahikātoa without qualifications), but if that is the case one would expect a name like kahikātoa-mā. Alternatively, the ma- element may just simply indicate that makahikatoa is similar but not identical to the kahikātoa, just as mānuka are similar to but different from the nuka. Kunzea tenuicaulis. This is a spreading, multi-trunked shrub or tree, which may grow to anything from a few inches to sic inches high, depending on the environment, and is confined to geothermal habitats in the Taupo volcanic zone. Kunzea toelkenii. This is a shrub growing to about four metres high among the sand dunes in the eastern Bay of Plenty. Kunzea sinclairii. A low, trailing shrub with silvery-grey leaves, which occasionally (but very rarely) may grow into a tree up ro six metres high. It is confined to Aotea (Great Barrier Island) in the Hauraki Gulf. The spreading leafy branches sometimes root when they make contact with the soil. Kunzea salterae. This is also a spreading, multi-branched shrub or tree; it may grow to 10 metres high. This species is endemic to Motu Tohora (Whale Island) in the Bay of Plenty. Kunzea triregensis. As its specific name suggests, this species is endemic to the Three Kings Islands. It is a reasonably tall tree, growing to about 18 metres, with half or more of the trunk bare, and a spreading canopy. Finally there is Kunzea ericoides s.s., a tree with needle-like leaves growing up to 18 metres high. This species is endemic to the northern South Island, but was the first to be described botanically. 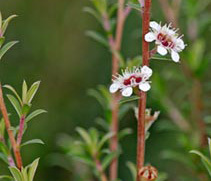 The other New Zealand species of Kunzea were until recently treated as variants of a single species bearing this name. 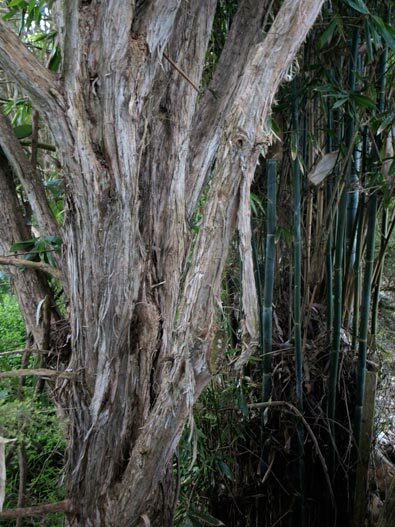 The bark of this tree does not shred or flake like that of Kunzea robusta and some of the other species. The writer notes that you will not see Pākehā chiefs suffering similar indignities. The word appears in printed English much later. Williams Dictionary first notes it in the third edition (1871), defining it as "leptospermum [sic] ericoides, a tree", but the first citation in the Oxford English Dictionary is dated 1906, a reference to the entry for Leptospermum ericoides in T.F. Cheeseman's Manual of the New Zealand Flora, which included mārū as a synonym for this species. Harry Orsman in the Oxford Dictionary of New Zealand English notes a slightly earlier reference by the botanist Thomas Kirk to kānuka, also in relation Kunzea (then Leptospermum) ericoides, on the East Coast in 1889. 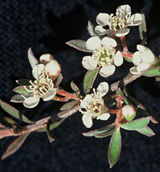 Its use as a tree name is recorded in the seventh edition (1971), including both "Leptospermum ericoides, a tree, and Leptospermun scoparium, a shrub". It is likely that this usage has developed from the process of using the branchlets of some species of kānuka especially, but also kahikātoa, for interlacing fences and constructing eel weirs, so that "mānuka rauwiri" has become simply rauwiri. Since the name is frequently associated with Kunzea linearis and Kunzea amathicola, it is likely that they were preferred species for this purpose. The word is a local production, probably originally a combination of rau "foliage" and wiri "to twist". References and further reading: See linked pages; also the general works on NZ trees in the bibliography. 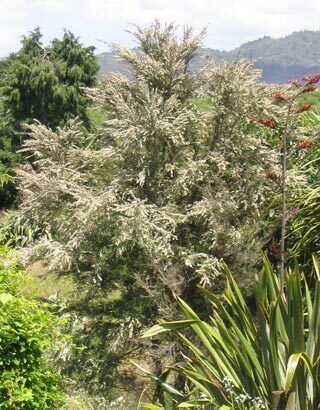 Photographs: Most of the inset photographs in the text are courtesy of members of the NZ Plant Conservation Network: Kunzea linearis (c) Peter de Lange; K. amathicola, K. serotina, & K. triregensis (c) Jeremy Rolfe; K. tenuicaulis & K sinclairii (c) Gillian Crowcroft; K. ericoides (c) Mike Wilcox. The others are by RB (Te Māra Reo).